The passage below was only a tiny part of Michelle Obama’s speech tonight, but I think the entire rest of the address, all 3,000 words of it, had only a single purpose: to make this one tiny part resonate by the time she got to it. ….And if so many brave men and women could wear our country’s uniform and sacrifice their lives for our most fundamental rights, then surely we can do our part as citizens of this great democracy to exercise those rights. Surely, we can get to the polls and make our voices heard on Election Day. That was it. That was the whole point of the speech: to convince disappointed Obama fans that her husband was worth getting off their butts and working for again. Change is hard. It happens one small step at a time. We’re playing a long game and you should be ashamed of yourself if you feel like quitting just because Barack hasn’t won every battle. Now get out there and vote. 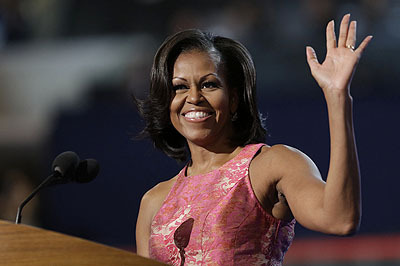 The rest of the speech was extremely well crafted and Michelle Obama delivered it like a pro. It hit all the right notes. There were no gratuitous partisan attacks (unless her remark that “the truth matters” was a subtle barb). I’ll bet it gets high marks in the overnight polling. But as good as the rest of it was, it was, in the end, just a superstructure designed to provide emotional support for the four sentences above. If they hit home, the speech did its work. If they didn’t, it failed.